America Remembers is pleased to announce the issuance of two special firearms featuring handsome portraits celebrating the life and career of James Arness. Each is decorated by specially commissioned craftsmen in strictly limited editions of 250 each. America Remembers has chosen one of the most popular rifles ever produced for the James Arness Tribute Rifle, the Model 94 Winchester in caliber .30-30. The James Arness Rifle is a true masterpiece, from the 24-karat gold and nickel embellished receiver with a special blackened patina finish, to the handsome walnut stock. Each rifle is accompanied by a matching numbered Certificate of Authenticity. James Arness gives a full account of his early years, his family, his military career, his film work in Hollywood which included appearances in the cult-favorite science fiction movies Them! and The Thing. He also talks about his 20 years on Gunsmoke, his role in the highly popular television miniseries How The West Was Won, and his life after TV. Jim talks about life on the Gunsmoke set, working with Miss. Kitty, Doc and Festus, as well as the many famous guest stars. Throughout are rare, previously unpublished photographs from Jim’s personal collection. Appendices include comments by show biz colleagues and fellow Gunsmoke alumni, and a sampling of letters received from his legions of fans. Actor and fellow Gunsmoke performer Burt Reynolds has written a foreword to the book. The James Arness Tribute Colt Cowboy Single Action .45 is also decorated in 24-karat gold and nickel with a special blackened patina finish. 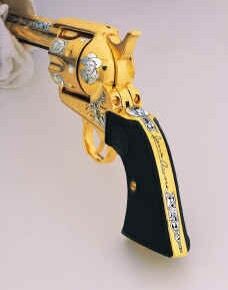 Each revolver comes with a numbered Certificate of Authenticity. Reservations are now being taken with an initial deposit and monthly payments.